Sharing discount: 25% off boarding for second pet in same enclosure. Dogs are walked on leash by our staff along a scenic scented woodland trail. Compatible dogs play in small groups in one of our large outside play yards with toys, ropes, Frisbees, and endless fun supervised by our staff. 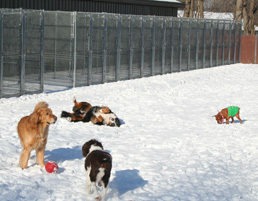 Non-compatible dogs can sign up for one on one playtime with our staff. A varying menu of gourmet treats including pigs ears, bakery biscuits, cookies and Frosty Paws (seasonal) delivered with one on one attention. Complimentary kennel bath with 7 nights or greater stay. Available to schedule during shorter stays. Price varies, please inquire at check in. Boarding includes Iams pet food, daily let outs (dogs to play yard, cats separately in cat room), and administration of any required medication. You may bring your own food. Please pack it in a plastic bag or a plastic container. Medicine should be labeled with the pet's first and last name, dosage and dosing frequency. You may bring your own bedding if you'd like your pet to have bedding in their kennel. Please only bring beds that are machine-washable. Weekend Boarding: There is a two day charge for all pets dropped off on Saturdays. This charge covers their stay from Saturday up to noon on Monday. While you are welcome to get your pet during our Sunday pick up time, between 4-5pm, for the exact same rate, you can leave your pet with us and pick him or her up on Monday before noon. Feel free to take advantage of that extra time to prepare for your pet's return. *We cannot accommodate late and early pickups. We ask that our customers please stick to scheduled pick up times as our schedule is vital to the health and well-being of all of our pet-guests. Thank you in advance for your understanding and cooperation. Vaccination Policy: Proof of vaccination (from a veterinarian) is required at check in. Please call with any questions that you have regarding required vaccinations or other health concerns.